Does anyone have suggestions on how to identify tweets with images for special routing through triggers? We auto-close most of our twickets, but do look at ones based on string search. We'd like to start monitoring ones that have images attached to the tweet as well. The only thing I can think of is to set up a trigger to test for a specific string in the comment text. I'm not 100% sure if all image links are truncated the same way once they make it into Zendesk, but using the first portion of the link (ie: https://t.co) could work. Say, is the integration working correctly? We've just tried to add a couple of new twitter accounts to Zendesk, but each time we've been faced with this error message. It says in the message that you guys have been notified, but just in case anyone else is having the same issue or if it's just us. Hey Adetona! Sorry for the delayed response here! It does look like there was an issue where the Twitter authorization was having some issues, but they have since be resolved. If you're still having problems, let us know so we can take a look! I can confirm that the issue appears to be resolved as far as we're concerned, we tried adding the accounts about the day before yesterday and everything seems to be working. But thanks for the confirmation none the less! Has this flow changed at all? I have 3 twitter accounts in ZD and am unable to find where to change one to primary. I'm going to go ahead and pull you into a ticket on this one. I'm going to get you in touch with one of my colleagues, Ben, who is a Social Media Product Champion. He'll be able to help you figure out what's going on. See you there shortly! The Twitter integration is really cool. However, I would like an option to create tickets automatically, but with a filter. For example, I don't want to have a ticket created each time that a user is using "RT" or "via" on his tweet. Is there any option for this ? Currently, at this time, you can't use a filter with the automatic ticket creation based on your account handle or direct messages from Twitter users that you follow to filter out tickets that contain certain phrases or words. Messages that contain these phrases, or that are not support requests, would still need to be manually deleted. However, that is a great product request that I encourage you to post in our Product Feedback Forum for automatic filtering! You can also take those phrases and use them in a business rule to automatically set those tickets to Solved or Closed in your Zendesk, so you do not have to deal with them (only manually delete if you would like). The condition for the trigger would be "Ticket: Comment text... > contains at least one of the following words > RT via". For the actions, you could then choose to set the status to either Solved or Closed. We have a couple twitter accounts linked and active. I would like to remove one. What happens to all the tickets created from posts and DMs from that channel? 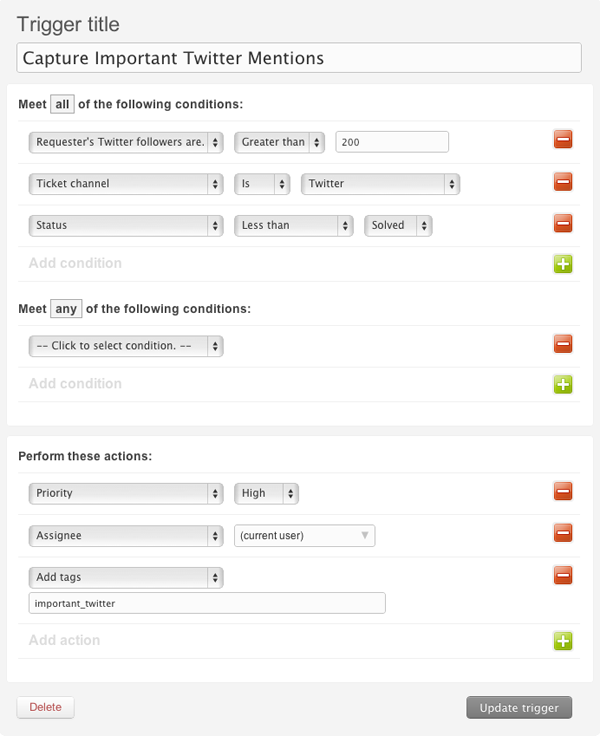 Also, is there a way to create a view to show all tickets that originated from a specific Twitter account? Thanks! Hey Bill! Welcome to the Community! You've actually stumped me on your very first question. :D I'm going to follow-up with some of my colleagues to find an answer for you. Stand by! Hi Bill! I have an answer for you! If you disconnect that Twitter account from your Zendesk, nothing will happen to the tickets. However, if you respond to any of those tickets trying to use that Twitter account, the tweets won't go out. Since you have multiple Twitter accounts, though, you can just switch those tickets to respond with the account that you're keeping and you'll be good to go! When should we see the character limit within Zendesk updated to reflect Twitter's new character limit of 280? Are you guys referring to the limits in direct messages or public tweets? Yes, when are public tweet replies going to have the 280 characters? This is already available in the open Twitter API so it should be available in any 3rd party platform. Hey Sarah, Alex, and Terry! Thanks for bearing with us while we looked into this for you. Our Product team is aware that customers are anxious to get the 280 character limit added to the Twitter integration. We do plan to update the integration to accommodate the new character limit, but we do not have a timeframe established for when this might be available. Other customers have been asking about this as well, and we have a ticket open on our end to track customer who contact us about it. I'm following that ticket, and I'm adding your input to it as well. I'll be sure to keep you posted if new information becomes available! So here's what's happening: in order for us to be able to accommodate the new 280 character limit, we need Twitter to update their text library. Once that's done there will be an API to account for the new character limit, which we'll be able to use to bring 280 character to our integration. At this point, Twitter says they hope to get this done sometime in December. This is completely up to them; Zendesk doesn't have any control over it, and we can't make any changes on our end until the update is made. We'll keep you posted as new information becomes available! QQ re passwords: we need to update our password, I'm assuming that is done by clicking "Reauthorize"? What is the process? Is there a field to update the password immediately or is there some back and forth with emails that happen first? Just trying to gauge how long our Twitter support will be down. Hi. Has the 280 character limit been updated? We're about to implement a Twitter-only help center, and this may be crucial! Yes, it was updated a couple of weeks ago, and is now live in all accounts. Happy Tweeting! How to make Twitter channel compliant with GDPR? Any user can mention us, which will create a ticket. And we already like storing their twitter ID without any consent. Please email this and any GDPR compliance related questions to privacy@zendesk.com. We have recently set up our Twitter channel and I have a question about user profiles. When a customer submits a ticket through our support portal, it comes in to Zendesk associated with their email and their account. When a Tweet is converted to a ticket, it comes in under the customer's Twitter name so that ticket isn't associated with any other tickets they already have or with their normal Zendesk profile that is linked to their email and their actual account. Is there a way to tell Zendesk that these Tweet tickets should be associated with their normal Zendesk profile? That will let you associate the twitter-handle-only end user with your existing end user. From that point forward, when someone creates a ticket with you via Twitter, it will be associated with that end user account (which contains both their twitter handle and their email address now). 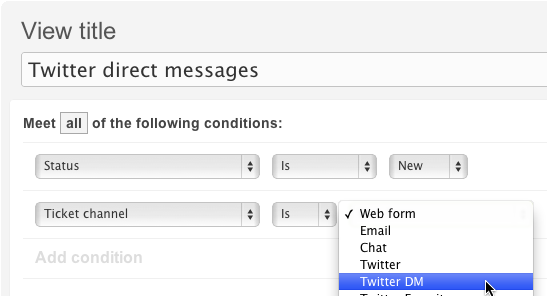 From the ZD interface you can choose to reply via DM or via email. I believe that if you proactively associate twitter handles with end user accounts then it will automatically associate twitter-created tickets with the correct end user. Thanks for jumping in to help, Joel! This is correct. Once the user's Twitter handle is added to their main user profile, any future tweets will be associated with that profile. Let us know if you need anything else! Now it's my turn for a question. If a ticket gets created via the Twitter channel and we receive an email notification of that ticket, is there any way to use the email API to respond and have our response go back via Twitter, rather than email? 1) Incoming ticket created via tweet or DM by a client who has an end user account that also has an email attached. In that case, responding to the ticket notification will send an email to the end user. 2) Incoming ticket created via tweet or DM by a client who does *not* already have an end user account with an email attached. In that case, responding to the ticket notification seems to eventually result in a suspended ticket indicating the response couldn't be processed. The suspended ticket is not immediate (in my experiments if you attach an email address to the end user account after sending the email, it will notice and then send the update as an email). I assume this is all expected behavior, and the answer is "no, you can't send tweets by responding to email notifications". Is that indeed the case? That's correct, that is expected behavior. 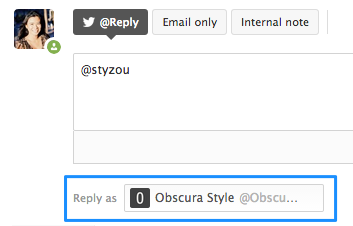 To send a response via Tweet you need to respond from the ticketing interface. The Channel Framework is not set up for responses to emails to then be processed by the ticketing system and spit back out as a Tweet.